The shoulder is raised, lowered or rotated by a group of four muscles (supraspinatus, infraspinatus, subscapularis and teres minor), which are called the ‘rotator cuff muscles’. They also help to stabilise the shoulder joint i.e. they serve to hold the ball at the centre of the socket. These muscles lie in a space between the top of the arm bone (humerus) and the prominent bone at the tip of your shoulder blade (the acromion). This space is called the ‘subacromial space’ and a fluid-filled sac (the subacromial bursa) fills it. This fluid sac allows for smooth gliding of the rotator cuff muscles under the spine of the shoulder blade, when the shoulder moves. Any single rotator muscle may tear and the tear can include more than one muscle. Wear and tear of the rotator cuff is usually age-related. Bone spurs may develop under the end of the collarbone or the spine of the shoulder blade, resulting in reduced subacromial space that causes repetitive pinching of the cuff. The tendon may gradually weaken and finally, like the cloth at the knees of old trousers, the tendon may tear. This process may cause pain and shoulder weakness of variable severity. The patient may often feel clicking and crunching on movement. A tear can also result from a single event like a fall or after unaccustomed and improper lifting. Tears can occur due to repetitive movement (overhead work). In sportspersons who do a lot of overhead activity, the under surface of the rotator cuff may become pinched in certain positions of throwing, resulting in pain. With time this may result in a cuff tear. The tear usually starts off as a minor tear but progressively increases in size. Similarly tears can be incomplete (partial tears) or complete (full thickness tears). What are the symptoms and how is the condition diagnosed? The main complaint is of pain, a pinching sensation and stiffness when the patient raises the arm. The pain is usually experienced in the upper arm and generally worsens at night. The symptoms make it difficult to do overhead work (such as comb your hair), and also restrict movements (like putting your hand behind your back) and sleeping on the affected side. The patient will feel shoulder weakness and a loss of movement. The shoulder may catch or a grating sound may be felt within the shoulder. Further investigations (x-rays, ultrasound or an MRI scan) may be recommended. They help to confirm the diagnosis, the depth (partial or full) and length of the tear and also the quality of the rotator cuff tendon or muscle. The x-ray below shows that the humeral head has migrated upwards. When compared with the x-ray above you will not see the reduced subacromial space. Treatment varies according to the severity of the symptoms, age, physical demands of the patient and the type of tear. In the initial stage painkillers and anti-inflammatory medication will be useful. Activities that aggravate the symptoms should be avoided. Generally physiotherapy is usually the first line of treatment in chronic or degenerative tears. You will be taught specific exercises designed to reduce irritation of the rotator cuff, improve flexibility of the muscles and provide balanced shoulder strength. An injection of steroid and local anaesthetic is considered either before or after physiotherapy depending on the symptoms. The steroid injection reduces inflammation and controls the pain. Improvement is variable and can be temporary. It is important that you are assessed a few weeks later and the response to the injection analysed. Repeated injections have the potential of weakening the tendon. If the tear is acute in the relatively young or symptoms have not responded to the above treatment, surgery to repair the rotator cuff has to be considered. Surgical repair of the rotator cuff (keyhole surgery): If the tear continues to be troublesome, repair of the cuff is recommended. If the tear is partial, (small to medium) the standard operation advised nowadays, is an arthroscopic cuff repair with subacromial decompression. The aim of the operation is to repair the cuff and increase the size of the subacromial space. About 3-4 small stab incisions are made around the shoulder through which a telescope (arthroscope) is passed. The surgery is seen on a monitor. The operation involves partial removal of the subacromial bursa, cutting one of the ligaments that is reducing the space, shaving away the bony spur and repairing the cuff. The cuff is reattached to the bone using special sutures that anchor into the bone. The advantage of keyhole surgery is that only tiny incisions are needed; the rehabilitation is quicker as surrounding tissues are not damaged and any other pathology (arthritis, biceps) can also be identified and treated. At surgery you will be given a regional anaesthetic block. This will cause numbness for approximately 24 hours. The aim of the block is to give pain relief following surgery and make the postoperative period comfortable. Following surgery you will have a large compression dressing and a shoulder sling. Depending on the tear and the repair, the sling may have a wedge between the arm and body. The arm is thus kept away from the body and the tension on the cuff repair is reduced. You may need a special sling for 4-6 weeks. Surgical repair of the rotator cuff (open surgery): If you have a large tear in your rotator cuff it may not be possible to repair by keyhole surgery. You will need open surgery to repair the tear. The length of the incision can vary between to 3 to 12cms. Surgical reconstruction of massive rotator cuff tears (tendon transfer or grafts): Sometimes the tears are larger. The tendon has retracted and is difficult to mobilise. In such a situation, complex operations may be needed. An artificial graft may be used on which new tissue can develop. Rarely, muscles (Latissimus dorsi) from elsewhere may need to be transferred in place of the torn rotator cuff. Shoulder replacement: Some patients with large, long-standing cuff tears may develop arthritis between the humeral head and acromion (rotator cuff arthropathy). In such cases, replacement of the shoulder may need to be considered. 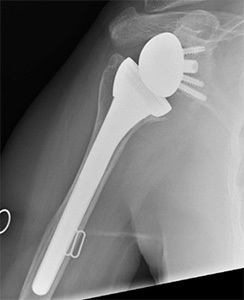 The type of shoulder replacement may vary from a partial shoulder replacement (extended hemiarthroplasty) to a unique type of shoulder replacement which reverses the ball and the socket (see illustration below). It is likely that the symptoms will linger indefinitely. The tear may increase in size leading to further shoulder weakness and an inability to lift the arm. The ball of the shoulder (Humeral head) will become unstable and move upwards as shown in the x-ray above. This may cause arthritis between the humeral head and the acromion (tip of the shoulder blade). The operations have a good success rate but each operation is different. Most patients see a dramatic and rapid improvement of their symptoms but outcome will depend on the size and longevity of the tear. The larger the tear the more time it takes to recover from surgery. Full function may not return for up to one year. Infection of the wound is possible. This is very rare in arthroscopic shoulder surgery; if it does happen it can be successfully treated with antibiotics. Shoulder stiffness is possible and hence it is important to follow the physiotherapy rehabilitation after surgery. Any surgical intervention has a risk of developing unpredictable complications that have the potential to leave the patient worse than before surgery. Failure to achieve a successful result or regain strength. A further tear of the tendon may occur. The larger the tear, the more chance there is of this occurring. Is there anything I can do to improve outcome? In the initial days after surgery the wound should be kept dry. Following surgery it is important to maintain correct posture and be compliant with postoperative exercises. It is advised against wearing rings on the operated side for 4-6 weeks following surgery. It is very important to be committed to the post operation shoulder rehabilitation, as this will make a great difference to eventual outcome. Return to work depends on many factors including the nature of the job and hand dominance. It also depends on the size of your tear and so advice regarding return to work is individual to each patient and this will need to be discussed. You will not be able to drive for a period of about 8 weeks. You should avoid sustained repetitive overhead work for at least 3-4 months following surgery. You could return to swimming (breast stroke) as soon as comfortable but you should wait for at least 3 months before resuming front crawl.